Dabbing. What is Dabbing? What is dab wax? Let’s answer these questions! Dab Wax is a type of BHO, which is short for butane hash oil. It is a type of cannabis concentrate made by extracting cannabinoids and terpenes from cannabis flowers using butane, heat and pressure. There are several types of BHO and we’re going to look at all of them, however, due to its color and consistency, BHO is also called butane honey oil—after purging the butane, the oil becomes a yellow-gold color similar to honey. There are several different types of BHO, however, all types have similarities in terms of the content, the purging (and extraction) processes and the end result, after it’s smoked, which is to say – the smoker will be very stoned. Budder is the purest form of BHO, usually having around 90 percent THC and 99 percent purity. It gets its name because the consistency is somewhat similar to that of butter and it is extremely hard to find as the extraction, purging and whipping process can take much longer than other BHO extracts. Budder tends to be rather rare and expensive but is oh, so good! Crumble is made by purging butane at a low temperature for quite some time (although there is no exact period for this—it depends on the amount being purged—the process usually takes 10 to 15 hours). Since it crumbles easily, it is not good for manipulating with the hands, however, it does add some kick when “crumbled” on top of a pipe load (or bong load)! BHO comes in oil form and this type of extract is mostly seen already packed in cartridges. It is easy to come by and many licensed producers make their own versions. Oil is easy to use in cartridge form and there’s no need to worry about having pieces of the extract sticking to gear. Typically, the cartridge fits into a Vaping device like a Vape Pen, which makes smoking the oil quick, easy and discrete. Pull and snap got its name because of the sound made when pulled apart. It is great for dabbing because of its consistency and because it is easy to handle; pull and snap is much better suited for molding, as it doesn’t break easily or melt in the hand. On the other hand, if you pulled on a piece of ‘shatter’, it would break in a glass-like manner, hence it’s name. Resembling the sap of a tree, this form of BHO is sticky and runny. If a person drops a piece of sap on the floor, for example, it will stick to anything and everything, thereby making it impossible to remove impurities like dust and dirt. This is difficult to smoke without a good dab rig. Shatter is the hardest form of BHO and is always in solid form. Resembling glass, it is transparent and breaks in a similar manner. Shatter often has around 80 percent THC and requires a dabbing rig to smoke it. Somewhat similar to budder, wax doesn’t crumble, but don’t hold it in your hands for too long as it will melt into a sticky mess. Wax is the most common type of BHO seen today, except for maybe shatter, because it is easy to work with. 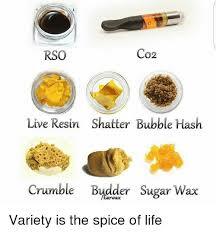 Smoking wax can be done in a dab rig or in a vape pen. Typically, a dab rig provides a surface (known as the ‘nail’) which can be heated so that when you apply the Dab it vaporizes. Cannabis oil can also be made with carbon-dioxide (CO2), which can serve as the extraction catalyst rather than butane. When cannabinoids are extracted and subsequently processed with CO2, the result is CO2 oil. BHO extraction is a risky process and, as such, a job best left to the professionals. There are instances in which people trying to make butane hash oil on their own have been severely injured or even killed. Why can BHO extraction be dangerous? BHO extraction uses butane, a flammable gas, as a catalyst to extract all the cannabinoids and terpenes from the plant material. Since part of the extraction process happens over a stove, this increases the risk. The gas takes liquid form in the tube during the extraction process, and then quickly evaporates when heat is applied to the mixture. After it evaporates, heavier-than-oxygen butane quickly “falls on the floor”. This is why making BHO indoors is extremely hazardous. Not talking about the dance craze, which, for those who don’t realize it, is based on the movement folks make when they’ve hit on a dab rig, they wipe their mouth and then … well the pointing upward is because they’re sinking into their couch! But, we digress. Why do people dab? Another way to think about this is: why do people drink high-proof distilled alcohol? Or drink high-percentage alcohol wine or beer? Or even, for that matter, why do people spin around in circles really fast until they fall down? Because they want to! On a more serious note, dabs are being demonized as a dangerously powerful drug in those states where cannabis is still illegal, while many smokers in legal states just scoff at dabbing as a sophomoric way to get higher than you need to, sort of like shot-gunning a beer. However, it’s possible dabs are actually more interesting than they get credit for. The first thing to consider is that there is evidence which points to them being far healthier than the standard way of smoking weed (but until the DEA reschedules pot, it’s very difficult to make definitive health claims about cannabis). Why? The high you get off a dab is quicker and cleaner than conventional smoking methods, and the dab itself is a ‘cleaner’ version of cannabis, having been processed into the various different forms. Thanks to modern strains that are 30 times more powerful than 1960s weed (and modern concentrates that can be 90 times more powerful), we no longer need to inhale a quarter of an ounce of burning plant material to get really high. And, that’s a good thing! So, in summary, dabbing is both a type of cannabis extract (the dab) and a way of smoking cannabis (the dab rig). The action verb “dabbing” means to consume the cannabis concentrate via some type of rig! And, always remember when it comes to dabs vs weed, a little dab will do ya! You can read more about consuming cannabis in our blog post Beginners Guide to CBD Oils and Tinctures and you can check out all our Cannabis Tours here!